Nancy is the fanciest member of her family. She loves dressing up in ruffles, ribbons and sparkly tiaras. Her family, however, are all plain and boring. So, she decides to give them lessons on how to be posh (that’s the fancy word for fancy). Nancy and her family have a fabulous night dressing up with accessories, going out for dinner and using fancy words, like ‘parfait’ instead of ‘ice-cream’. 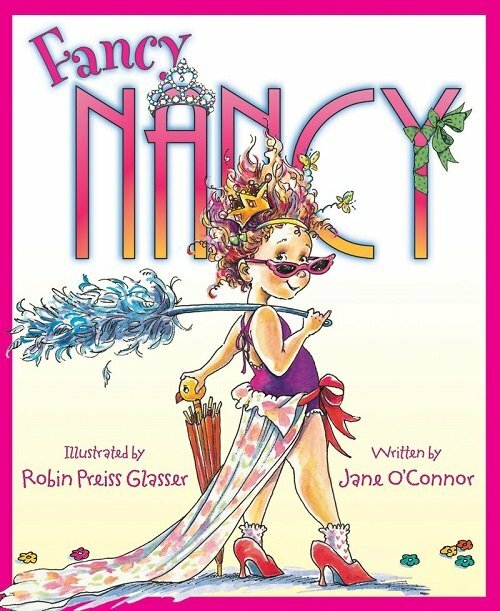 Fancy Nancy is the first in a series of books about Nancy, the little girl who loves everything fancy. It is an ideal book (and series) for introducing higher level vocabulary as Nancy often uses a rare word, followed by an easier-to-understand synonym to explain the word further (e.g. “...stupendous. That’s a fancy word for great”). The illustrations are incredibly detailed, keeping the reader and listener interested while offering lots of opportunities to practice describing skills. The book is written in the first person, from Nancy’s point of view, and provides fantastic models of sentence structures using the subjective pronoun ‘I’ and possessive pronoun ‘my’. For further speech and language targets in Fancy Nancy, see the list below.